Las Vegas: Las Vegas Ceilings. 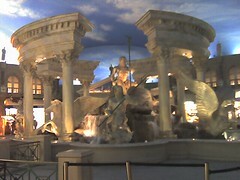 I think this was in the Caesar's Forum Shops, one of Las Vegas' most exclusive shopping venues, but the feature I wanted to note in this picture is the great painted ceiling - a feature that is found throughout most of the large casinos but one that adds a lot to the experience. I think the Aladdin has my favorite of the painted ceilings, and at the Aladdin you can even see an indoor rainstorm - especially great for kids and raining down about every half hour for most of the day and night.